Robert Charles Alomes, son of Robert Alomes and Elizabeth Bellett, was born on 26 Jul 1820 in Pittwater, was christened on 29 Oct 1820 in Hobart, died on 29 Jan 1860 at the residence of Adam Franklin Aulert, 65 Hampden Road, Battery Point, at age 39. He was buried on 1 Feb 1860 in Ralph's Bay. Robert married Jane Wood on 28 May 1844 in Hobart. Jane Wood, daughter of John Wood and Sarah Nash, was born on 11 Nov 1820 in Hobart and died on 19 Dec 1858 in Richmond at age 38. They had seven children The sixth was George Thomas Alomes, born on 27 Apr 1852 in Spring Bay. Robert next married Susannah Baker on 9 Jun 1859 in Rokeby. 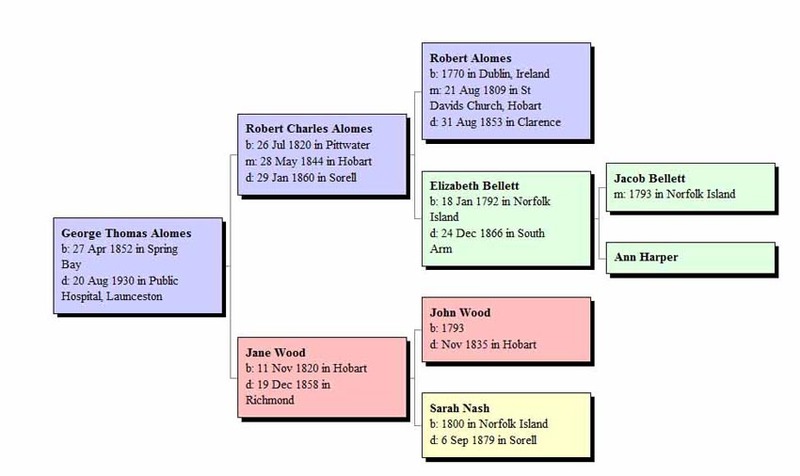 Robert Alomes, son of Colonel Carter of Dublin, Ireland was born in 1770 in Dublin, Ireland, died on 31 Aug 1853 in Clarence at age 83, and was buried on 5 Sep 1853 in Rokeby. His mother was a Ms. Allomes/Alomes which is thought to come from the french D'Alloems. See the book From Chains to Freedom written by Thais Mason. Robert Alomes was educated at Trinity College, Dublin. He was studying medicine at Trinity College and after a quarrel enlisted in the Royal Marines under his mother’s name. He entered the army as an ensign, but ran away to England and joined the navy. He was a marine at the siege of Gibraltar, 1732, on the ship "James" under Sir Charles Summers. He quarreled with his father and came to the colonies with Governor Collin’s expedition in HMS Calcutta, as a Royal Marine's Sergeant on 9 Oct 1803. On 16 Feb 1804 he immigrated to Risdon Cove, near Hobart, Tasmania in the "Ocean". He stepped ashore with the British flag and planted it on behalf of Lieutenant-Governor David Collins, where Hobart is now built. On coming to the colonies he changed his name to Alomes. The first reference to him is in The Historical Records of Australia Series III Vol.1, p.10 7 where he is included in a list of persons victualled on 17 October 1803, described as a Sergeant. He was stationed on Norfolk Island on military duties sometime after coming here in 1804. By the Governor’s orders he was brought her to Van Diemen’s Land and was married on 21 Aug 1809 in St. Davids Church, Hobart Town. They were one of the first couples married in Tasmania and when the event took place they were entertained to a wedding breakfast by Governor Collins at Government House, the latter on that occasion presented him with 50 sheep, including several lambs. He received a grant of land at Pittwater 2 miles from Sorell and was a prosperous colonist. He became a farmer at Pittwater owning 30 acres in 1809. As Robert Carter he married Elizabeth Bellett. Of 11 children born to Robert and his wife, seven were baptised as Carter and four as Alomes, also spelt as Allomes. The following baptisms have been found of children born to the couple, some under the name of Carter and others under the name of Allomes. 1 married male aged above 60 years, arrived free. 1 married female aged above 45-60 years, born in colony. 3 single males aged 21-45, born in colony. 1 single female, aged 7-14, born in colony. 1single female, aged 14-21, born in colony. 1 single female, aged 21-45, born in colony. All were Church of England. Robert married Elizabeth Bellett on 21 Aug 1809 in Hobart. vi. Elizabeth Carter Alomes was born on 3 Mar 1812 At Sorell and died on 8 Mar 1902 at age 90.
viii. George Thomas Alomes was christened on 18 Feb 1827 in Sorell. Elizabeth Bellett, daughter of Jacob Bellett and Ann Harper, was born on 18 Jan 1792 in Norfolk Island, died on 24 Dec 1866 in South Arm at age 74, and was buried on 26 Dec 1866 in St Barnabas, South Arm. Elizabeth married Robert Alomes on 21 Aug 1809 in Hobart. John Wood was born in London in 1793 and died on Nov 1835 in Hobart at age 42. John married Sarah Nash. Sarah Nash was born in 1800 in Norfolk Island and died on 6 Sep 1879 in Sorell at age 79. The first child from this marriage was Jane Wood, born on 11 Nov 1820 in Hobart and died on 19 Dec 1858 in Richmond. First Fleet Convict ↑Jacob Bellett and Ann Harper on Norfolk Island. Jacob Bellett arrived on Norfolk Island in 1791 and started farming. By 1793 he was selling his first produce, and in that year he met and married Ann Harper. In December 1808 they were evacuated to Van Diemen’s Land. They first had 45 acres at Queensborough and later were granted 40 acres at Glouster (Sorell). Jacob and Ann had nine children. Their first born child was Elizabeth in 1792. She married Robert Alomes in 1809 who at that time was a sergeant the royal marines. Susannah married John Birchall, Jacob married Mary Fisher, Mary married James Garth, Ann married Edward Garth, William married Catherine Erwin and George married Jirrima Larson.